Our innovative model-based technology transforms process expertise and process data into a wide range of applications in development and manufacturing and enables a solid basis for decision-making and automation. Formalized process knowledge ranging from simple trends through interdependencies of process variables to process models and systems of models provide the structural framework of our technology. Within this backbone we embed cutting-edge machine learning solutions to unveil and integrate the versatile information hidden in the big process data. This hybridization yields powerful process models which are tailored to the specific needs at different stages of process development and manufacturing. 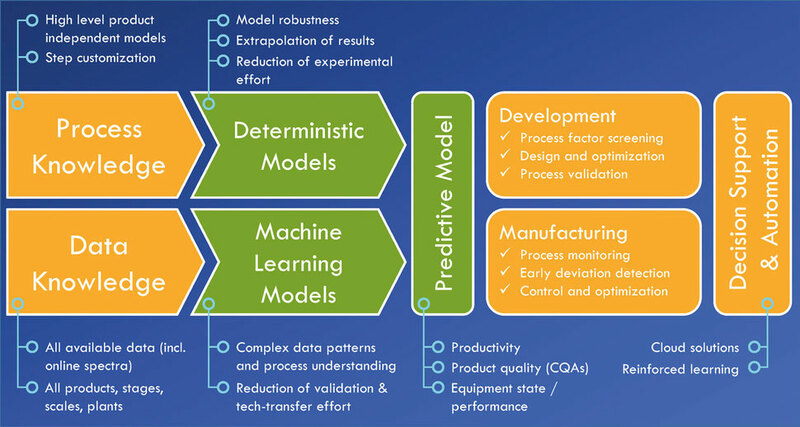 Such models require less experiments for training compared to conventional DoE-based approaches and have a much stronger capability of extracting new process knowledge and finding optimal process operation routes. The ultimate goal of such models is to support decision making and process automation. In particular, cloud solutions can help the model to compare the current process with all available process history, inside and, when possible, outside the company. At the same time, machine learning tools can be trained not only to predict the process, but also to take decisions (the so-called reinforced learning), for instance for process control and global optimization purposes.